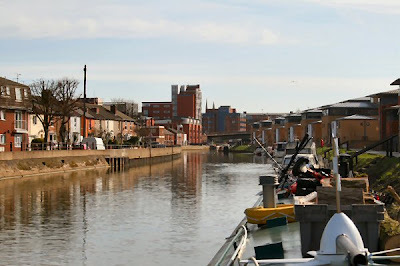 After a couple of cups of tea I left the mooring near the Pyewipe Inn and set off for the BW facilities in Lincoln. If you are looking for a quiet mooring with a pub nearby then I recommend this one. A nice steady plod passing canoes and the occasional fisherman and I deposited my bag of rubbish in the bins provided. Not far from here, just a couple of hundred yards further on, there is another mooring. This is at the end of the university accommodation and is just an overnight stop. Can be a bit noisy but I have never had a problem with the locals out enjoying themselves of an evening. Rubbished dumped I moved on the centre of Lincoln and through the Glory Hole. As you go through take a good look at the underside of the arch. Some of this dates back to 1160 and was once called Murder Hole. The shops to be found over it are 16th century. It can be a bit awkward through here if you meet someone coming the other way so keep a good lookout. The mooring here is right outside a pub and just after the pedestrian footbridge and the Waterside shopping centre. Very handy for Wilkinsons where I was going to get some means of securing the bike. Purchases made I sat on the stern people watching and enjoying the sun for half an hour. A trio of cruisers came past and only just made it under the bridge. They were off towards Boston so that they could go through the guillotine lock not having gone that far before. There is a slight bend as you leave Lincoln centre and here I met one of the cruisers coming back. It is rather narrow here so I had trouble turning on the bend and lost one of the fenders as the fender on stern caught on the side. Luckily they float so walked back and rescued it. By the time I arrived at the lock two of the cruisers were still on the Lincoln side of it. There was an enormous amount of rubbish in and before the lock. I hooked out several sheets of polythene and bubble wrap and several logs. They had already started and had got out a road sign and two chairs. Much of what was left was the plastic bottles and reeds. We swapped keys as theirs was already in the lock controls and I closed up after they left. No trouble locking down and tried to move some of the junk left behind the gates. The first 2 km out of Lincoln one gets ones fill of seeing plastic bottles caught up in the reeds and on the bank. There must be thousands of them. Although the view isn’t the finest you do get a nice one of the cathedral and a bit later the villages on the edge of the scarp. 4km out and the floating mooring at Washingborough comes into view and it is here I shall spend the night. Just four hours from the previous mooring without rush and a lazy hour in Lincoln. The mooring is right next to the cycle/foot path that goes all the way to Boston or if it isn’t finished soon will do. It runs along the old railway line and is easy travelling if you’re into biking. Hi, i was the cruiser you met coming back through Lincoln. We were waving madly at you as we had stopped for a chat on the towpath the day before whilst we were walking back from the pub. Think you were busy extracting your boat from the river wall though!!!! Nice to see you out and about and maybe we will meet again at some point on our travels.